If your “Who’s Viewed Your Profile” chart is flatlining week after week, these tips will help breathe new life into your profile, improve your presence in search results, generate more views, and impress your audience. According to LinkedIn, users with complete profiles are 40 times more likely to receive opportunities such as job offers, mentors, or new business. Your LinkedIn profile is your digital resume. You can add more detail than you can on your printed resume. It will set you apart from your competition. Don’t get too creative in the name field, but add professional credentials, suffixes, and designations (i.e., MBA, Jr., PMP). Don’t use symbols, numbers, special characters, email addresses, or phone numbers in the name field because that could prompt LinkedIn to restrict your account. A photo puts a face to a name so you’re not just another silhouette. It helps establish trust. A photo makes your profile seven times more likely to be found in a LinkedIn search. What’s acceptable? If you’re a creative director, you might want an edgier photo, as compared to a CMO who might want a more traditional pose. CMI’s community manager Monina Wagner’s photo radiates her personality, making her likability factor skyrocket. Whatever you do, don’t use a selfie, company logo, you with your furry friend (unless you are a veterinarian), or your #TBT college photo. These types of images could damage your personal brand. If someone wouldn’t recognize you at a professional event based on your profile image, change it. Be mindful of your background. Using a bright color (like orange) will help you stand out from the crowd, especially in a thumbnail view. See what I mean? Use the same image on all social media channels to help build your personal brand. Headshot pixel size: 400 by 400 is ideal. Width or height cannot exceed 20,000. File size cannot exceed 10MB. Move your cursor over Profile at the top of the home page and select Edit Profile. Move your cursor over your photo and click Change Photo. Your background photo is like a billboard for you. Use it to generate interest, build credibility and trust, and give your audience a quick glance at who you are, what you do, and why they would want to connect with you. Use the space wisely. For example, if you are an author or consultant, include your book covers. Doing so will help position you as a thought leader and help build credibility. Check out the profile of CMI’s Robert Rose. If you want to promote your company, include a branded image like the example below from CMI’s Michele Linn. 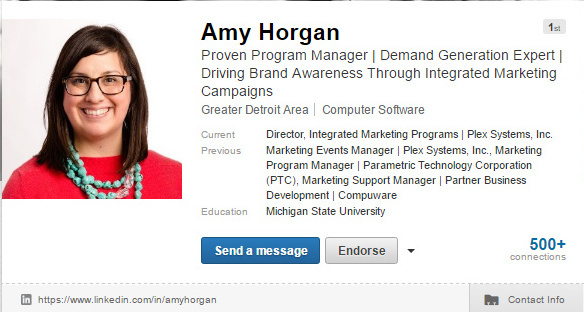 Or show your company pride as Amy Horgan does in her background photo. Creating custom art is always best if you have design capabilities or can hire a pro. If your photo is blurry or pixelated, LinkedIn recommends using a compression tool such as Trimage for Windows or ImageOptim for Mac before uploading it. Background image pixel size: Between 1,000 by 425 and 4,000 by 4,000 is ideal. File size cannot exceed 4MB. Hover your mouse over the background area (in the middle) and click on the Edit Background rectangular button that pops up. Your headline — the text below your name — is prime real estate. The LinkedIn algorithm seems to consider it one of the few heavily weighted areas in search, and it is one of the first things your audience sees. Be descriptive and use keywords that uniquely define you. Include your city to help your profile stand out 23 times more. Support what your headline says throughout your profile. Use searched-for words like: content strategist, B2B blogger, author, content creator, social media community manager, or content marketer. Pamela Muldoon’s headline is a great example. Don’t use words like ninja, guru, super star or rock star. Instead of saying you are great, demonstrate it in your profile. Use keywords that your target audience would use to find someone like you. Incorporate them in your headline and summary description. If you need help finding relevant keywords, use the free Google AdWords tool even though it’s not directly connected to LinkedIn search. Go to your profile, move your cursor over your professional headline section (or any section) and click to add, edit, or remove content. Think of your summary as your elevator pitch. Brag about yourself, but keep it real and back up your claims throughout your profile. Say things like “award-winning” if you have won awards. Cite publications where you’ve contributed articles. List the industries in which you have expertise. 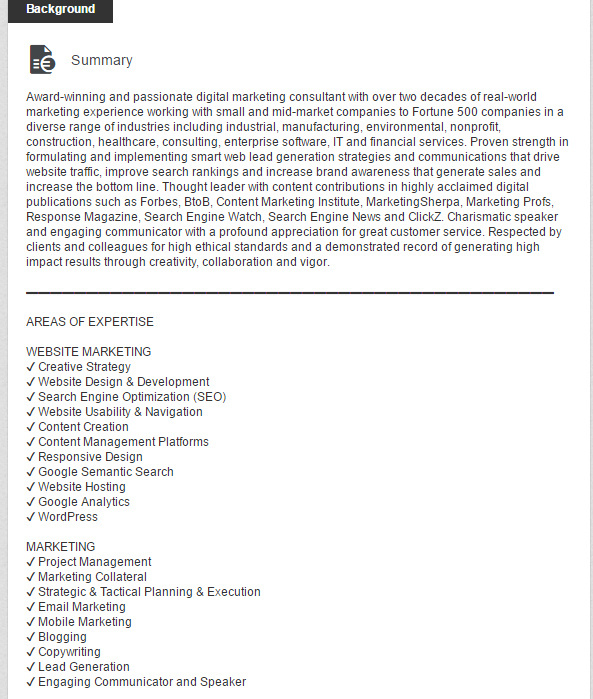 Add an “areas of expertise” section to incorporate relevant keywords that describe your skill set. Craft the summary (and headline) as others see you. If you’re stuck, ask a friend or colleague to describe you. According to a LinkedIn study, 52% of people have an easier time talking about other people’s accomplishments instead of their own. Add personality to your summary. According to a LinkedIn study, nearly 87% of recruiters are looking for it. Use bullets and/or symbols, in your summary section to stand out but use them conservatively. Feel free to copy and paste the symbols and bullets for your profile. Go to your profile, move your cursor over your summary section (or any section) and click to add, edit, or remove content. Your profile’s default URL doesn’t exactly roll off the tongue. Create an easy-to-understand URL. 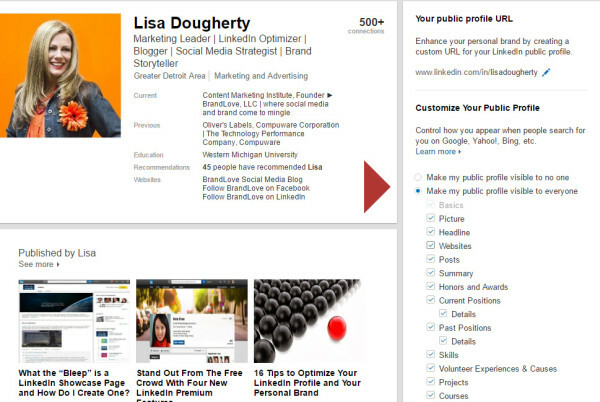 Customize like I did: http://www.linkedin.com/in/lisadougherty. This URL is far more SEO friendly. Include your custom URL in your email signature, resume, blog, etc. Vanity URL character limit: Recommended to use between five and 30 — don’t use spaces, symbols, or special characters. Change your URL by clicking “customize your public profile URL” on the right. You can learn more about the process here. Another great example is from Roger Parker, publisher, blogger, and author. 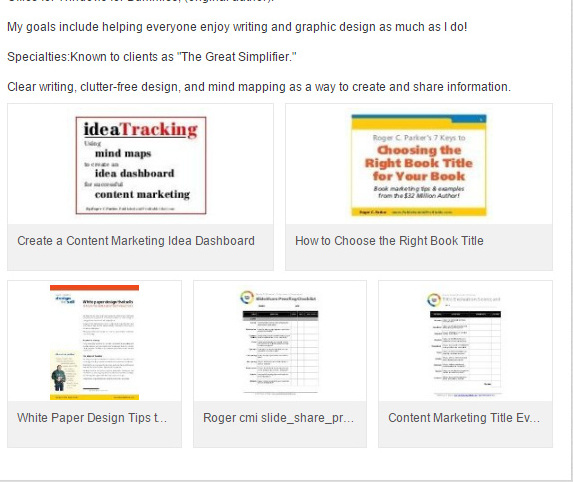 He includes a few SlideShare presentations, articles, and a book excerpt. Find a couple statements in your summary to represent visually. Have you contributed to an industry blog or written a post for your company? Have you given a talk or presentation? Share the link, badge from the site, slides, or video. Buddy Scalera shares a link from an article he contributed to the CMI blog. Use Internet Explorer, as I’ve had trouble doing this in Chrome. Add media samples to your summary, education, and experience sections on your profile by moving your cursor over each section and clicking the “add media” icon. Ensure that your video, audio, and images are on the list of supported file types that your profile can link to. Writing long-form posts on LinkedIn can entice viewers to stick around to read what you have to say. It also helps you be seen as an influencer to a targeted audience — your connections. You also expand your reach to the first-degree connections of anyone who engages with your post — a previously unreachable audience. Plus, LinkedIn automatically sends a push notification to all your connections notifying them of your post, reducing your content distribution efforts. Create a short, catchy title. Paul Shapiro of Search Wilderness found that titles between 40 and 49 characters received the greatest number of views. Include a clear call to action at the end of your post. Ask your readers a question to encourage them to comment. If your post earns comments, “likes,” and shares, it has a better chance to be featured on LinkedIn Pulse, expanding the reach of your content to the potential of millions of views. Send a tweet to Tip@LinkedInPulse with your post to improve the odds a LinkedIn editor will see it. One of Cathy’s posts was featured in the marketing and advertising category. 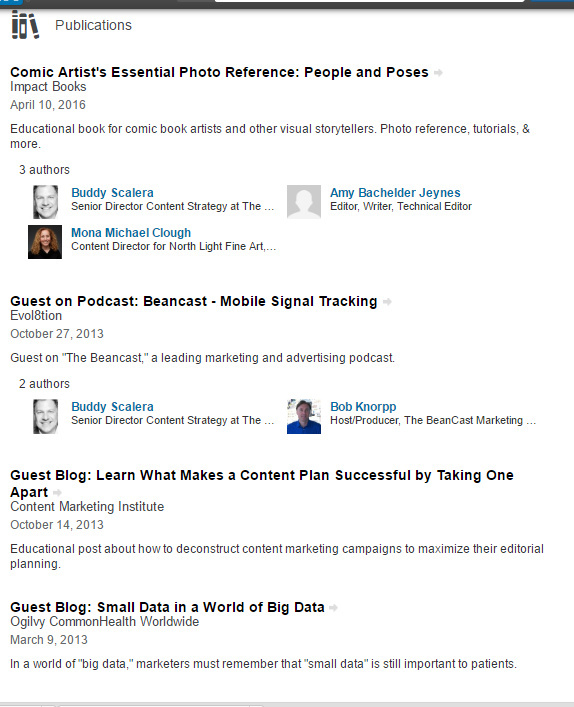 Learn how to publish long-form content on LinkedIn. Not all geographic locations have this capability at this time. You’ll see a Publish a post button on your home page when you have access. Make it easy for people to contact you. At the bare minimum, you should include your email, location, Twitter handle, and website address. If you don’t have a personal website, include your company’s, your blog, or your LinkedIn company page. The Contact Info tab is under your connections number on the right side of the top half of your profile. Display up to three website links customized with your company or blog name. For example, rather than choosing LinkedIn’s standard “blog” label, brand it with keywords that indicate what your blog is about, like BrandLove Social Media Blog or Follow BrandLove on LinkedIn. This optimizes your profile and drives traffic to your other online properties. Customize the links by editing your profile, clicking edit on your website links, and selecting “other” in the drop-down menu to customize the anchor text. At the bare minimum, include your current position, industry, and dates of employment. LinkedIn members with current positions receive up to five times more connection requests. 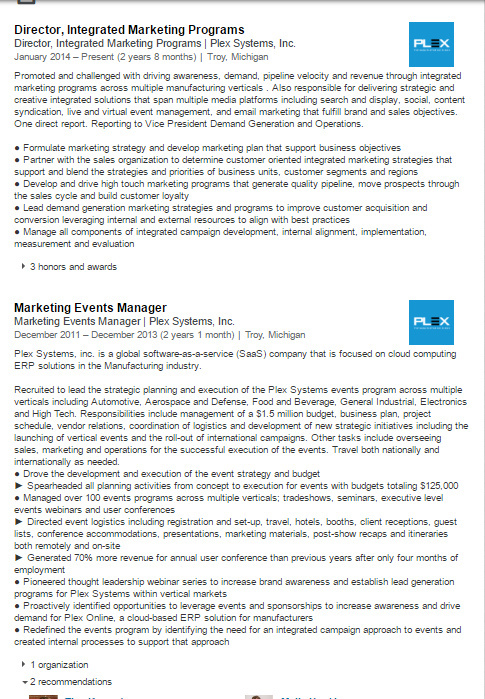 Also, include a high-level summary of what your role is and some key achievements. A good rule of thumb is two to four sentences to summarize each job (plus bulleted achievements). Link to projects, courses, certificates, honors and awards, work samples, recommendations elsewhere in your profile that relate to the position. This is more proof that you are who you say you are. Add your work history, not just your current job. You never know what criteria people are looking for. Customize your job title and company name so it’s more descriptive. You don’t have to use the default, as shown in Dianna Huff’s profile. Add, remove, or manage your experience from the Edit profile section of your profile. While LinkedIn no longer requires three recommendations to have a complete status, it still is important to have them from colleagues, management, people you manage, vendors, or customers. 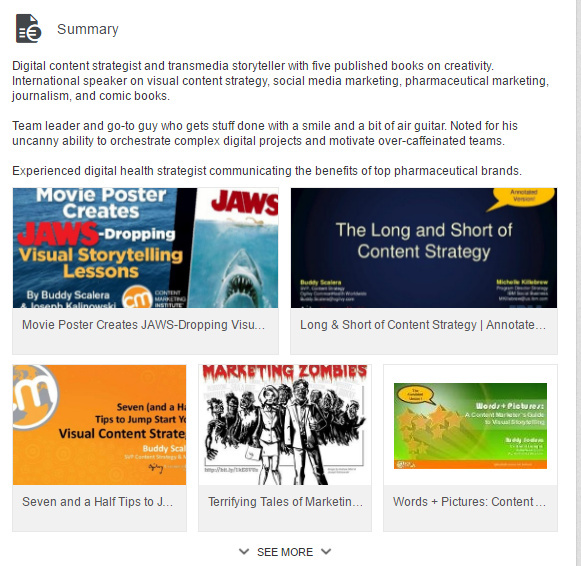 Recommendations show up underneath each position for which they are written along with a thumbnail profile photo of the person who wrote it. Qualify your relationship by including how long you have known each other and describing your relationship. Describe a project that you worked on together. Note if they would work with you again or to provide their contact information for more information. Have at least two or three recommendations for each position. Solicit C-suite endorsements, which could do more for your brand than 10 recommendations from colleagues. Gain additional exposure when the recommendations appear in your connections’ news feeds. LinkedIn provides detailed instructions on how to request (or remove) a recommendation. Endorsements are one-click acknowledgments of your talents from your network. They also affect your ranking in LinkedIn’s search algorithm. Having at least five relevant skills help people connect you to opportunities. According to a LinkedIn study, inclusion of these skills will result in up to 31 times more messages from recruiters and other members. For example, I have 99-plus people who have endorsed me for social media marketing. When a hiring manager or recruiter is searching for people with the skill “social media marketing,” my profile is more likely to come up on the first few pages of the search results. Rearrange your skills in the order you prefer. Drag and drop the skills that match your work experience the best (and number of endorsements) near the top. Don’t send a mass email asking for endorsements. Segment your network according to how you met them or what industry they’re in. Write a personal e-mail telling them why you feel they best understand your expertise in (fill in the blank) and that you would appreciate an endorsement — if they feel you deserve it. 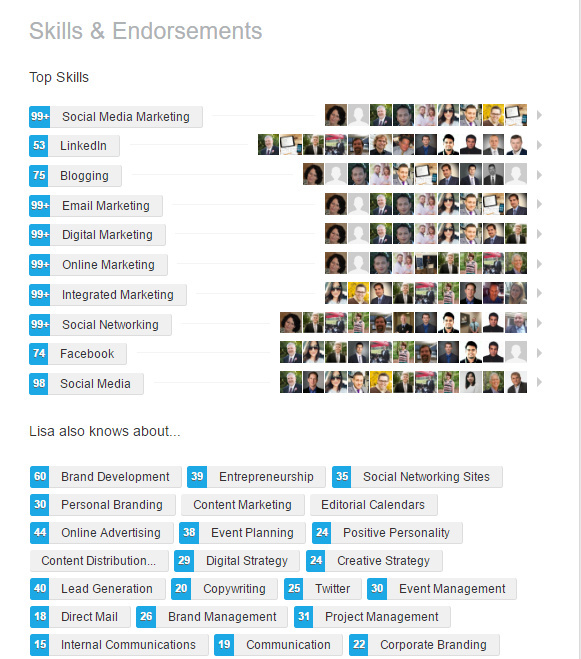 Add, remove, or manage your skills and endorsements from the Skills and Endorsements section of your profile. What you do out of the office says a lot about you and contributes to a higher search ranking. In fact, 42% of hiring managers said they view volunteer experience equal to formal work experience. Also, viewers may want to connect with you if they are passionate about some of the same causes. Take a look at Monina Wagner’s profile. 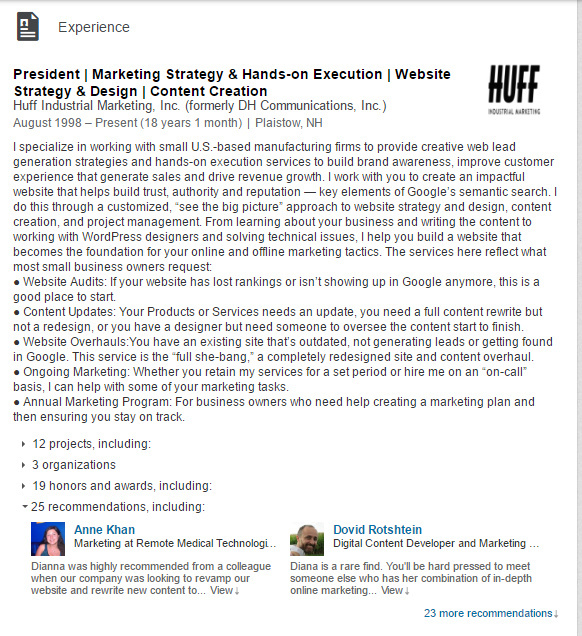 Adding organizations and professional memberships are another way to incorporate keywords into your profile and show viewers your commitment to your craft, as shown in Dianna Huff’s profile. They also can boost location-based searches. The Publications section is the perfect place to link to your contributed blog articles, e-books, and other cited work. Take a look at Buddy Scalera’s profile. He links directly to Amazon where you can purchase his book. Brilliant. 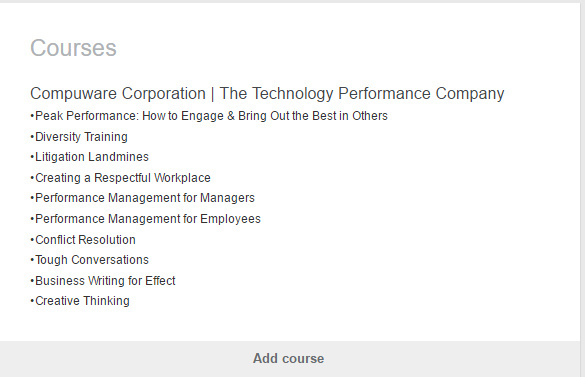 If you don’t have a degree or certification that reflect your experience but have taken professionally related classes or received on-the-job training, showcase those in the Courses section. 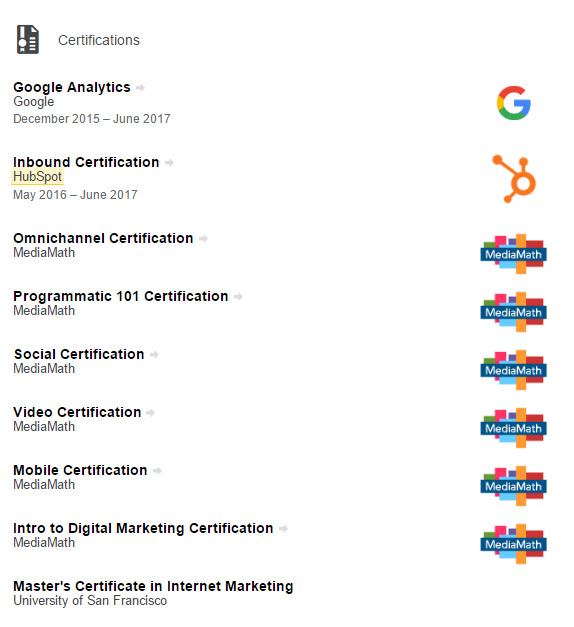 If you have some college education but didn’t finish, add any industry-specific training you have completed in the Certifications section. Include a link to allow viewers to learn more. 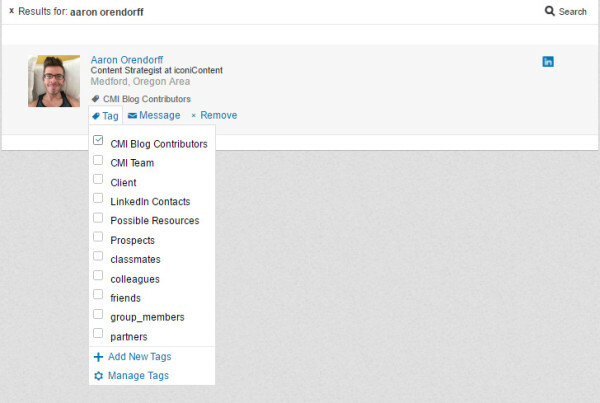 Go to your profile, move your cursor over each section and click to add, edit, or remove content. Click on the View More button to see all the profile sections available. Adding a Projects section allows you to name your project and input a URL so viewers can click to see what you did and give the originating site an inbound link. You can specifically relate your project to a position that you currently hold or to a previous position. Add team members if you are connected to the project collaborators. Add sections for projects by moving your cursor over each section and click Projects to add content. Click on the View More button to see all the profile sections available. Join groups related to your industry or niche and be an active participant in two or three. Only 16% of LinkedIn members are in the maximum number of groups (50). According to LinkedIn, your profile is five times more likely to be viewed if you join and are active in groups. When participating in group discussions, remember that groups are about community not about you or your services. 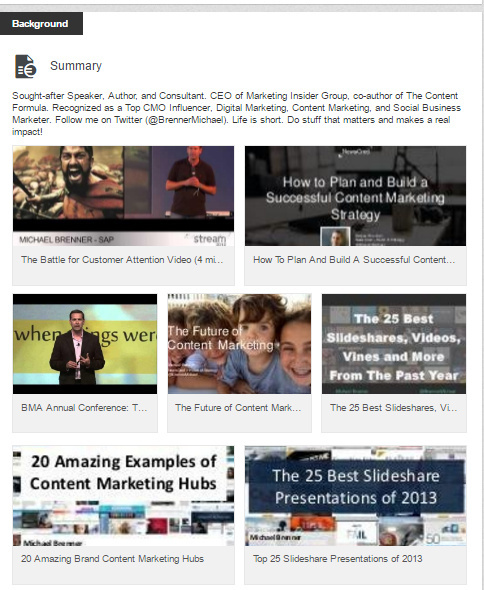 Andrew Davis generally suggests sharing four relevant pieces of content from influencer targets and one original educational piece of content for every sales-related piece of content. Directly message a member of the same group, bypassing the first-degree connection requirement. View profiles of members of the same group without being connected. Read these best practices on group participation so you don’t get sent to LinkedIn jail. Find and join a group by searching for relevant groups from the search field at the top of your home page. 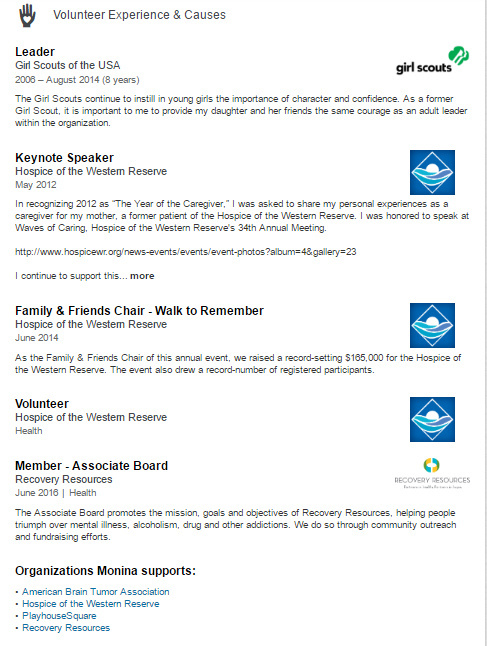 LinkedIn enables you to reorder the sections of its profile template. 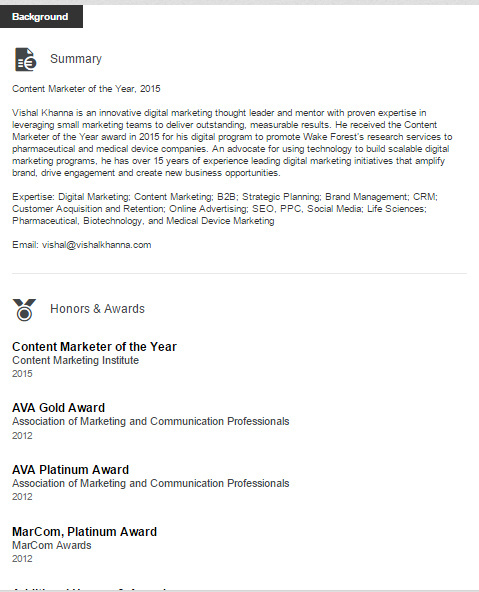 For example, Vishal Khanna moved up his Honors and Awards section to directly below his Summary section. You only have a short time to impress your viewer. What are you most proud of? Awards? Skills? A SlideShare presentation? If you’re a recent grad and don’t have robust experience, move Education to the top. Rearrange your profile so your most important work is at the top. LinkedIn provides instructions on how to change the order of sections on your profile page. 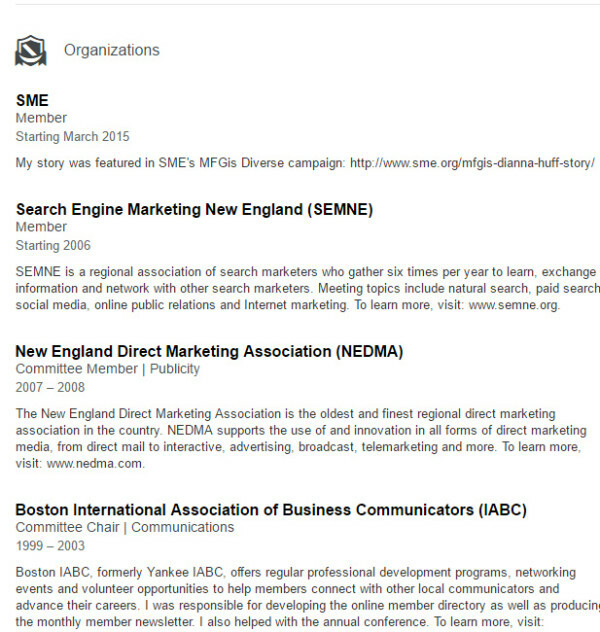 Your LinkedIn profile will appear when anyone searches for you on Google, Yahoo!, Bing, etc. 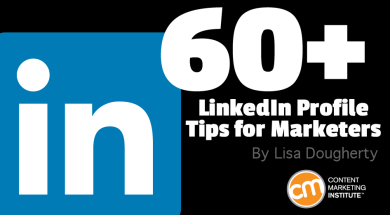 It can be displayed to LinkedIn members who email or have meetings with you if they connected their email or calendar apps to their LinkedIn account. You can print your profile to a PDF format. Including most sections of your profile adds credibility to your profile when potential hiring managers are trying to determine the credibility of a potential candidate or execs looking to do business with you. Go to your profile, and click the “settings” icon next to your URL. Next, click on the pencil icon to edit. Make sure that you enable the setting that allows anyone to see your public profile. When asking to connect with someone, use “we’ve done business together” rather than “friend.” Do some quick research before reaching out and include a personal note that explains how you know the person, or where you met, or who you have in common. For example, let them know you just purchased their book, are in the same group, or saw them speak at a conference. Beware. If you invite too many people to your network and they mark your invitation as someone they do not know, you will be banned from inviting new people to your network unless you know their email address. LinkedIn doesn’t say specifically how many is too many, but I’ve heard between five to seven “I don’t knows” triggers restriction. You are allotted 3,000 invites and required to enter a Captcha (verifying you’re human) for each invite over 100 sent in 24 hours. LinkedIn has a feature that allows you to segment your connections. Once you’ve made the connection, make sure you “tag” them into certain folders. This turns LinkedIn into a powerful CRM tool that allows you to target messages to individuals or groups of people. There isn’t an easy way to go back and tag your contacts except one by one, so I highly recommend doing this each time you add a connection. You can tag or untag anyone who’s saved in your LinkedIn Contacts. They can be added to a person’s profile or from your Connections. With over 433 million members and recognition as the go-to social media platform for professionals, LinkedIn cannot be ignored. A lively and comprehensive profile can be your ticket to a plethora of opportunities that will come knocking on your virtual door. If you follow these tips, you’re well on your way to making a killer first impression and your Who’s Viewed Your Profile chart will no longer be flatlining week after week. 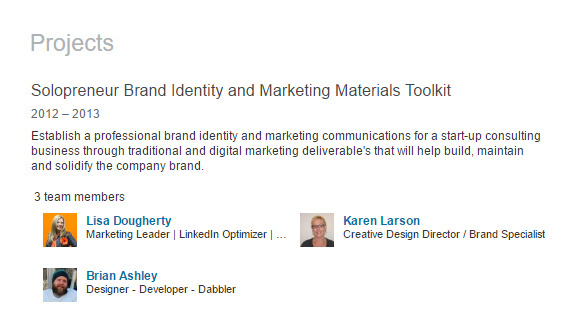 How has your LinkedIn profile helped your personal branding? What opportunities have you seen because of it? Want to continue building your personal brand and expand your content marketing skills? 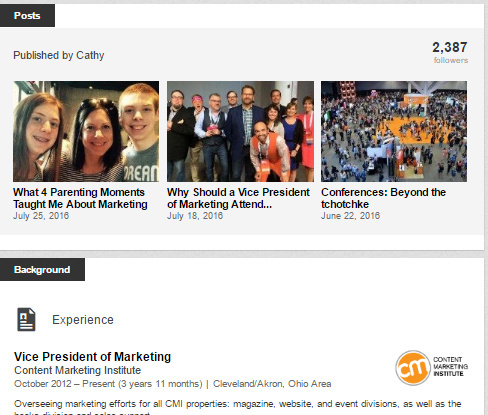 Subscribe to CMI’s daily newsletter with tips, trends, how-to, insight, and more.